I try to post on a Sunday evening so I can give an update on the work completed by Mustang Maniac during the week and the work I do at the weekends. The reason I haven’t posted is quite simple. Trying to catch-up on the huge amount of I have taken and the huge amount to work the MM (Mustang Maniac) guys have done. Most of the photo work has been completed now and hopefully the delay will be worth it. Where do I start? The first thing I noticed when I turned up was the back of the car was sitting in a white primer where Terry had cleaned and seam sealed it up. The back of the trunk is to get blown over of the Acapulco Blue when the car goes for the full paint job. In the mean time a couple of light undercoats of colour will be applied to the areas that you can’t paint once the rear quarter panels are welded in place, such as the chassis drop off points and the top of the rear arches that can be seen when you open up the trunk. The hinges I prepared last week were cleaned up and given a spray and hung up to dry. The next part to be spotted was the upper cowl that had been fitted in place and welded to the lower cowl. The Black resin coated parts in black are now all welded in place and brazed as they should be. Tape was placed over the vents and masking paper placed in the vents to avoid any and dust and rubbish getting into the fresh paint. The paper will be pulled out at the time of fitting up the rest of the car. As I wanted an export brace on the front of the car going from the fire wall to the shock towers this one was going to be fitted correctly. What I mean here is that the export brace was fitted to a thick piece of plate also welded onto the top of the fire wall to add the required strength. Many export braces fitter later in life are just bolted into the original shock tower bolt holes and the fire wall. Under load the firewall will bend and give which defeats the whole point of the export brace being fitted. The welding you see here is exactly how it was when they were first fitted, no neat seam all round welding, just the little lines of weld you see in the close up. The brace is only resting in place as its not needed at this point of the restoration. When I arrived on Saturday Terry was competing the repair plate to the roof and quarter panel lead area. Yes you read that correctly – lead, not filler and welds as modern restorations will do for you, but this lucky little lady was going to get the forgotten art of leading and brazing the quarters in place. The filler and welding are not ideal and could blow through with damp and rust at a later date. The Common place to have the rust appear is at the top of the B pillar as the water runs down and sits at the back of the strengthening sections and so it will eventually rot. Welding and filler will be especially susceptible to the damp. Red oxide paint was applied to prevent any more rust. The replacement plates in this area are common and the secret is make sure the plate are lower than the rest of the roof in order for the lead to run into any holes and fill the cavity up with strength. It’s this attention to detail that sets these guys apart from everybody else. Anyway, I was given my task to strip the doors down to find any of Adam’s nasty little surprises as he likes to call them. The door, oh yes the lovely left side drivers door. The stripper was applied to door and the first layers of paint was removed no problem. Then I spotted it – filler. Ok, the filler was to mend any cosmetic issues for paint, so I kept telling myself. So the door got more stripper and more scrapping. The filler patch got bigger and bigger until it was across three quarters of the door. 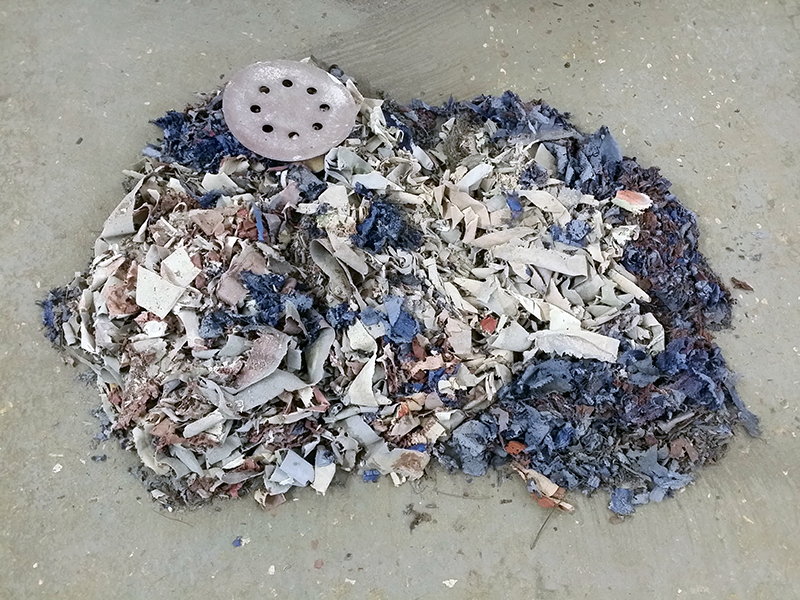 I asked Terry to take a look who said “You have to get it all out to see what is behind it”. So the door got more stripper applied to loosen the filler, then more and more. The scrapping knife was lifting the filler out like a spread of butter until the next layer of filler needed to be softened. Now I was going through the stripper like you wouldn’t believe as the filler was soaking it all up. The breakthrough to the metal was a good moment to behold and I thought I had cracked it, but no. The filler was about half an inch thick in some places, then I found out why. The car has had a knock in the door. There was regular holes in the door skin to pull the dents back out again with a slide hammer. At this point Adam was called down to survey the damage. Then he said “all the filler has to come out to see the full damage”, that’s consistency. Two hours later the filler was all out. The door panel was now fully exposed and any pressure on the door and the door popped inwards as the metal was stretched beyond repair, the filler was holding it tight. If I had of known this then we would have replaced the skin in the first place on the outside of the door. The door had to come of to strip the skin. Adam went and got a skin and brought it over “it’s your lucky day – it’s the last one.” The door was mounted and the skin was knocked away from the door by breaking the spot welds. The inside of the door would show the damage if any done to the structural part of the door. The skin was popped off a little while later being careful as they were trying not wanting to damage the door frame. The skin was lifted off and with the inside exposed we could see the heavy rust at the bottom of the door and the thin metal about to break away. Not good. The side strengthening bar part of the frame had been bent on the initial impact and had not been straightened out at the time. Even worse. The arrows in the pictures show the areas of concern, the bent frame and rust holes. In case you are wondering how much came out of the door? This much. The decision was made the door could not be salvaged with the amount of rust inside and the damaged bar. Yes, of course they could fabricate new parts and weld in place, but the man hours would out way the cost of the door. Terry went and got a new door. I had spots before my eyes or was it “£” signs, i’m not sure now??? Terry then offered up the door and fitted it along the B pillar and the sills. Adjustments had to be made with the door catch to make it shut correctly. Terry’s time – a lot! 1 x scrap cart full of my nice clean, paint free, bent door skin that has more bullet holes than Al Capone’s getaway car! One man was not impressed. BUT, some you win – some you loose, the original drivers door was a write off and that is the chance you take with old cars unless you know the history. I soon got over it once I had seen the new door in place. Oh, yeah it looked good. The other door Adam stripped down for me, that one was fine and OK to prep for paint. I think he was feeling sorry for me at this point, I did give him his door skin back though!! AND it only took him an hour or so to get this far. The door surround was cleaned up while Terry was prepping the door for fitting, this part of the bodywork came up pretty clean all round the inside and I was pleased with the results. The door fitted with the clean pillar and inner door frame cleaned up looks amazing. It was a silly long day and I would a special thanks to Terry, Adam & Frank for helping me out. I had a good laugh and it was great to see the new metal on the car and some colour. 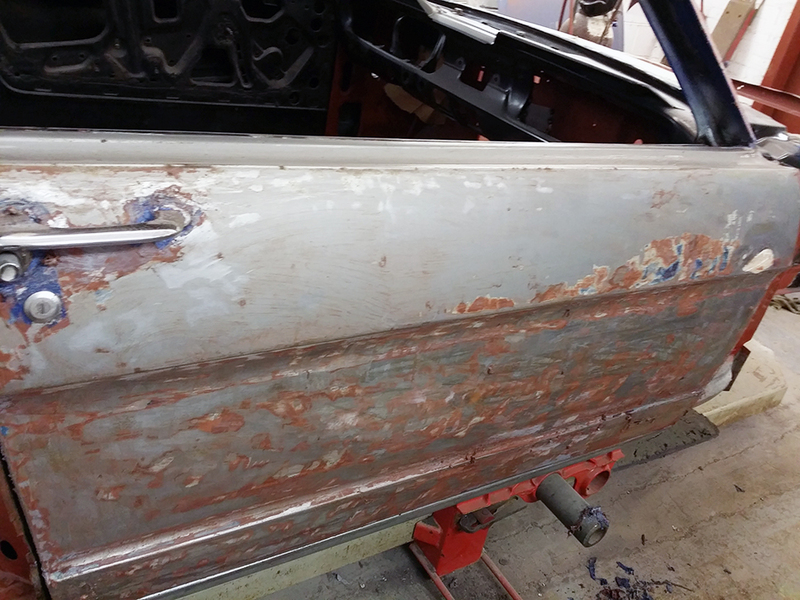 This entry was posted in Car, General, Photo's and tagged Acapulco Blue, cowl, door, export brace, filler, Mustang, One man and his Mustang, paint, panel, primer, rear quarters, Red Oxide, replacement, rust, scrap, seam sealer, skin, Stripper. Bookmark the permalink. So sorry about your door…all the time you spent on it and still had to get a new one. I thought you meant real bullet holes at first but my husband straightened me out and explained the entire process. Hi, Thanks for the thoughts. Yeah it took ages and it was a pain to see it. But I could of stripped it down and it was fine. The other door was fine so it wasn’t to bad. Just materials and time was the sad part, on the up side it’s a new door and I know the door is problem free. The last thing you need is to do the work and watch the paint bubble up and you have to do it again. So I’m not upset just an additional cost I hadn’t banked on. It’s an old car and it has history so there was bound to be something I hadn’t banked on. I can’t wait to see the work this week, I know what they have done so I will post as soon as I can all about it. Just tell me, is Adam and the team working only on your car or they do (in parallel) others? Watching your Mustang getting ready or being restored seams to me a titanic work. I think I told you this before. And thanks for the door’s price. It doesn’t surprise me, I guess is correct. The guys all work wirh other cars at the same time, they all gave their own strengths at wirk to those, Terry panels, John mechanics, Yogi resto mods, fitting, suspension, bespoke builds etc. They all do what is needed and at some point they all have had a part to play in it. It’s big job because we made it so. We could have done a cosmetic restoration where it would look nice for a while but would need doing again. Like the door, leave the filler in and paint over it, the rust at the bottom would have come through the paint and need doing again. So it was our choice to do the full bare metal nut and bolt restoration. That way we know 100% its a safe and sound car to drive. If that makes sense? A lot of sense! I’ll choose the same thus right now I don’t want to be in your anxious shoes. I mean we know how mustang looks and run like, however watching ever step makes me nervous too. Making some major progress. Looking really good. It’s great you can get new door skins for old cars. The rear door on a friend’s old Mercedes got badly dented. He thought the body shop was going to have to do a lot of bending and bondo filling to fix it. They simply bought a new skin for it! It certainly saves on costs, by the time a panel shop knocks ou a dent, fills it paints etc its cheaper for a skin n spray. Mustangs have had the parts for years now and they have almost got the panels as good as the originals. A real plusvwhen on a budget. Ok i spent hours getting it back to metal, but at least we knew for sure. The other door was fine so I couldn’t be upset.